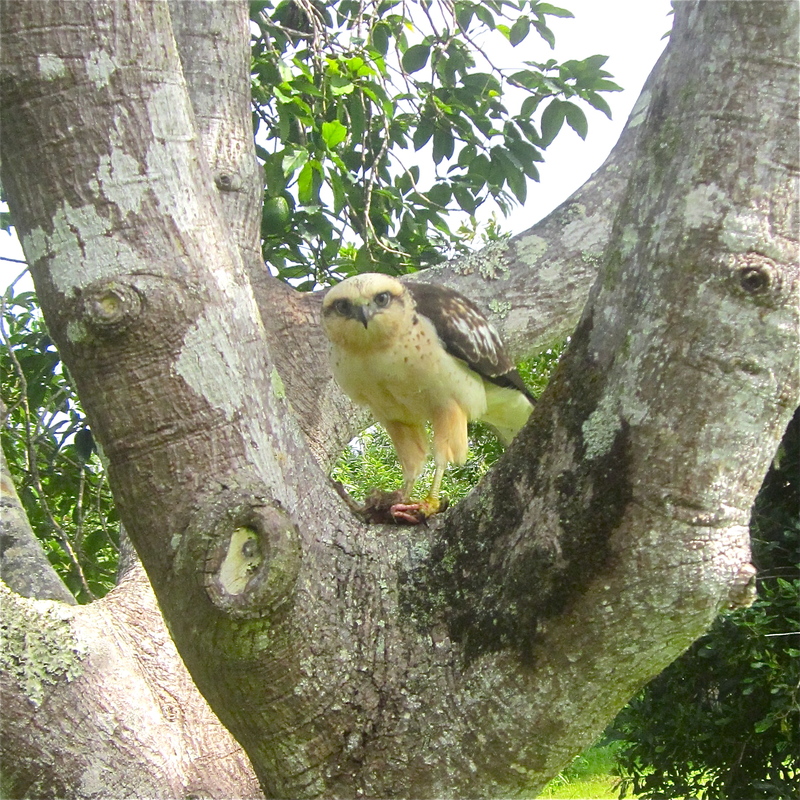 The Hawaiian “Io” Hawk was in the crook of one of our avocado trees, just a few feet above the ground. The sun is setting, there’s a light mist, it’s very quiet, and I am feeling tired and happy. My husband James’ boils are healing slowly but surely. The air is cool and breezy. And Juli and the Dolphin are settling in. Last night James and I drove to the airport to pick them up. All sort of signs appeared and continued today. Not billboards because Hawaii doesn’t allow them. But when we got to town James went to get some coffee and just as he was leaving the store, all the power went out! And then we hit a brief pocket of torrential rain on the highway. By torrential I mean that it was so intense we were instantly blinded by a wall of water. We had to slow down to ten miles per hour. Thankfully we were out of it in a few minutes. But when we got to the airport part of the road was flooded with police vehicles blocking the areas deepest in water. This was surprising because in the 40 years James has lived here, the airport has never flooded. It only rains at the airport a couple of times a year. The total rainfall is about ten inches which is why, James explained, they built it there; no bad weather hardly ever. It was pouring. I stood under a roof, waiting for our friends. There was a counter with expensive orchid leis draped over the top. Juli and the Dolphin were the very, very last people to come out. I had brought two cheaper leis for the occasion but now was festooned up both arms with welcoming offerings of aloha. Hawaiians believe rain blesses an event. Today, we all sat in silent awe as a giant Hawaiian Hawk rested on a branch a few feet above the ground and calmly ate its prey, never flinching even when five of us –James, our two workers, Juli and me, were there. Again, in all the forty years that James has lived here, he has never seen a hawk this close for this long. Hawks are a good omen, too. This afternoon the Dolphin explored the labyrinth of decks and the bridge that joins them by herself. She perched on a chair, hugging her knees, contemplating the view of the ocean. The Dolphin, who is 16-1/2 years old and has Rett Syndrome, has never gone out of her home on her own to explore before. Not even once. Today, she was unstoppable.